Andhra Pradesh Post Graduate Engineering Common Entrance Test (AP PGECET) is a State level entrance exam conducted every year by the Andhra University on behalf of the Andhra Pradesh State Council of Higher Education (APSCHE) for admission into 13 postgraduate engineering, technology and pharmacy programs offered by its participating institutes. A total of 272 institutes coming under the flagship of 7 universities participate for admission of candidates. This year the exam will be conducted from May 10 to 12, 2018. The exam is conducted only through online (computer based) mode. The entrance test will be held on 10th, 11th and 12th May 2018. It will be held in 6 regional centers this year across the country namely Vishakhapatnam, Guntur, Kakinada, Anantapur, Tirupati, and Vijayawada. The centers will be allocated to the candidates on the basis of preference entered while applying. Duration: The test will be conducted for 2 hours on the specified dates. There are sections of the test depending upon in which of the 13 courses, the candidate has applied. The Mathematics and the Engineering sections have to be mandatorily attempted by all the candidates. All the questions are of multiple choice type (MCQ). There are a total of 120 questions. All the questions are of multiple choice type (MCQ). Each correct answer is of 1 mark. There is no negative marking for a wrong answer. Medium: The exam is conducted only in English medium. Candidate must have passed the qualifying exam in B.E. /B. Tech/ B. Pharm with minimum 50% aggregate. For Reserved category candidates, minimum 40% aggregate is required for their qualifying exam. Candidates who are pursuing B.E. / B. Tech will also be eligible to apply for admission provided they have completed the prescribed course and passed all the subjects from the concerned university on the date of AP PGECET counselling. Candidates need to be a permanent resident of Andhra Pradesh or Telangana and they need to prove the same through documents. Note: Candidates who have successfully cleared the entrance test for admission conducted through GATE need not appear in AP PGECET. The cut-off percentage for admission of these candidates will be decided by the university and the qualified candidates will be eligible for direct admissions. The applications form for AP PGECET will be available since the first week of March 2018 for all the candidates in the online mode. The last date of submission of the application form is in the second week of April 2018 and the last date for submission with late fee is in the fourth week of April 2018. A student can apply through only through online mode. No offline application form is acceptable this year. Pay the application fee (Rs 800 for General and Rs 400 for SC/ST). Choose the payment mode: Debit Card/ Credit Card/ Net Banking. After the payment, candidates will receive a transaction ID which has to be kept safe for future reference. Go to the Registration link. Provide the Payment Reference ID, Qualifying Exam Hall Ticket number, Mobile number, and Date of Birth. Personal Details: Name, Father’s name, Date of Birth, Nationality, Gender, Category, Territory, Marital Status, Religion, Income details, Local/Non-local status. They must enter Hall Ticket number of Class 10th or equivalent. Other Details: Whether Physically Handicapped, Employment Status. Qualification Details: Eligibility criteria, Relevant qualification, Main subjects, Year of passing, Division, %age of marks. Correspondence Details: Address, City, State, Pin code, Telephone number, Fax number, Mobile number, E-mail ID. Select the program you wish to apply for. Give your preference for the exam center. The scanned image of photograph and signature in JPG/ JPEG format is submitted and the file size should not exceed 40 KB. The candidate has to verify whether all the details are correct. Then click on Submit. A unique registration number will be generated which has to be noted down by the candidate for future reference. Logging in– Candidates must enter the Payment Source, Transaction, Mobile, Date of Birth, SSC (10th Class) Hall Ticket Number and Month & Year of Passing SSC (10th Class). Enter Details– After logging in, they have to enter their personal details, academic details and GATE scores. Submission and Print out of Application Form-They must print the application form after submitting it. They must note down their AP PGECET registration number. The GATE qualified candidates do not have to give an entrance test. The application form is to be used for Admission and Counselling session and the required dates will be released later. The admit cards will be released most probably in the fourth week of April 2018. The candidates can download their admit cards online from the Official website. 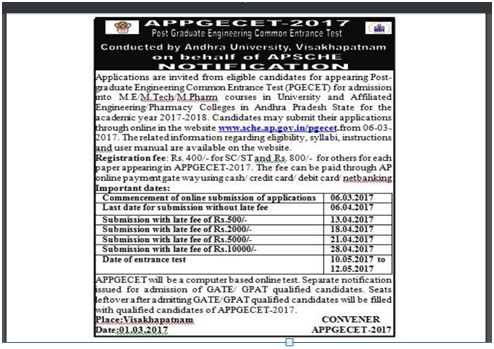 Click on ‘AP PGECET Admit Card’ Download. Enter your registration number in the blank which says ‘Download Hall Ticket’. Select the Department name from the drop-down list. The Admit Card will appear and can be downloaded and printed after carefully checking all the details and in case of discrepancies, authorities have to be informed. A candidate must carry his/her admit card along with a photo identity proof (Aadhaar Card/ Voter ID Card/ Passport/ PAN Card/ Driving License) and AP PGECET Application Form otherwise he/she will not be allowed to take the exam. Once the exam is over, the results are declared tentatively in the third week of May 2018 wherein the scores and ranks secured by the candidates can be checked online by entering the registration number, date of birth and exam paper for the entrance exam. The scorecard appears on the screen and it contains rank, percentile, score and qualifying status of the candidates. The candidate should take a print out of the result for future use. The cut off is decided after the results are declared. A candidate who clears the cut off will be said to have qualified the test. The cutoff is decided by the examination authority taking into consideration factors such as exam difficulty, number of appeared candidates, total marks of the exam and number of seats. On the basis of scores, candidates are selected for the applied programs. Ranks will be allotted to the candidates who meet the qualifying percentage marks which is 25% i.e., 30 out of 120. There are no minimum qualifying marks for candidates belonging to the SC/ST category. A separate rank card is released for qualified candidates. The candidates who qualify the AP PGECET test, as well as GATE qualified candidates, are required to attend the counselling session. The counselling session comprises of verification of documents, payment of counselling fee and web option entry. Qualified candidates need to attend the document verification in person. They have to sign in the register and pay the counselling fees before the verification of the certificates. The fees is Rs 600 for General and OBC categories and Rs 300 for SC/ST categories. The payment can be done through Net Banking/ Credit Card/ Debit Card. Candidates should collect their scratch cards after document verification containing their serial number and password for web option entry. They have to enter their web options as per their preferences after logging in. Candidates are allotted seats on the basis of their choice, merit, and availability of seats. After the seat allotment, the candidates have to visit the allotted institute for admission and complete the remaining formalities. The notification for AP PGECET will be published by the Andhra Pradesh State Council for Higher Education every year in the month of March. The notification will include complete details about the dates for submission of application form, deadlines to submit applications with and without late fee, examination fees, and the official website. The following screenshot shows the notification issued last year. For complete list, check out the official website. The results for AP PGECET will be usually available in the last week of May on the official website. Last year it was available on May 27, 2017. The students must visit the official website and go to the results page wherein they will be required to give their registration number and date of birth details and must select the stream for which they have appeared for. 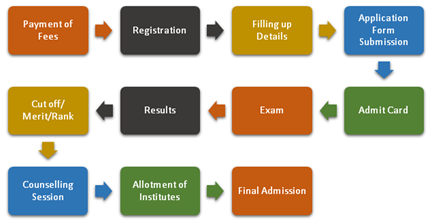 After providing the required details, the students will be able to check their results. The candidates can download their rank cards from the official website. The rank card will have the candidate’s name, father’s name, score, rank, percentile and qualification status. Last year around 29,000 candidates appeared for the AP PGECET examination and approximately 26,000 candidates qualified it which accounted for a pass percentage of 90% (approx.). The AP PGECET score is valid for one year from the date of examination. The seat distribution of the participating colleges including their complete profile is available in the official site for admissions. The students must visit the given link, click on “Institute Profile” where they will find a set of colleges listed along with the respective codes. The students can click on the code given for each college to view the complete profile of the colleges. Once the results are declared, the notification for counselling will be issued on the official website. Personal call letters for counselling will not be issued to the candidates. Candidates must visit this site and give their hall ticket number and click on the online payment link where they must pay a processing fee of 1000 INR for general category and 500 INR for reserved category. They can make the payment through credit or debit card or net banking. On successful completion of payment, a transaction ID will be generated which the candidates must make note of and inform the concerned authorities on the day of certificate verification. The counselling will be conducted first for the students who have cleared GATE/GPAT exam and then the remaining seats will be allotted to the candidates who have qualified the AP PGECET exam.